I purchased this as a convenient breakfast choice for my daughters. Read to find out why I was disappointed. 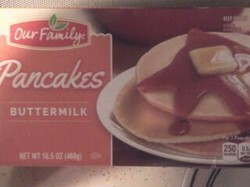 Product Description: Frozen buttermilk pancakes from the Our Family brand. I purchased a box of 12 frozen pancakes at one of our local grocery stores yesterday afternoon for $2.35 and ended up preparing some of them (a total of 4) for my daughters this morning as part of their school-morning breakfast. I had to run to the grocery store yesterday afternoon to pick up a couple of items and, while I was there, I decided to look for some easy-to-make breakfast items for my daughters to have during the school week. This meant a trip to the frozen food section and, ultimately, purchasing a box of Our Family Buttermilk Pancakes. There were a couple reasons why I purchased this particular product. The first was the fact they were convenient. This is something that is important on school mornings because I'm usually trying to get the girls fed before I have to leave for work (and to drop my oldest daughter off at school on the way there). The other reason I purchased this product was price. I had a choice between these and pancakes from the Eggo brand and, because these were about 30 cents less, I decided to buy them instead. Unfortunately, the overall quality of these pancakes really didn't justify the cost savings. I ended up making these for my daughters this morning before work/school, taking four out of the package and cooking them two at a time in the microwave. While doing this I did try a piece of one to see what they tasted like and, for the most part, thought the pancakes tasted OK. However, much like some other bargain-priced frozen pancakes, these did not do so well in the microwave. They came out a bit tough to the point they were hard to cut and hard for the girls to chew. As a result of that, even though they didn't seem to mind the flavor, they both also ended up leaving quite a bit on their plates. When I've had this in the past, I've found I can work around it by heating the pancakes in the toaster oven and will probably try that with the rest of these. However, as I mentioned, I purchased these for convenience. If I have to cook them in the toaster oven (which takes longer) then they don't offer nearly as much convenience as they would if I could make them in the microwave. Another thing I found I didn't like about these pancakes was the way they were all wrapped together rather than in separate pouches (as is the case with the more expensive brands, like Eggo). This meant I had take the time to close up the bag to avoid freezer burn. Granted, it's not that huge of a deal and it wasn't something that took a great deal of time. But, again, for 30 cents difference in price, I could have purchased a brand that sealed the pancakes in a preferred method. As I mentioned, these didn't taste too bad. But, other than the taste, the overall quality did leave something to be desired and, given the relatively small difference in price, I would likely choose the more expensive Eggo brand next time. I purchased this product this past weekend and had it for lunch. Read to find out if I got my money's worth. I purchased this spaghetti brand yesterday afternoon. Read to find out what I thought of it.